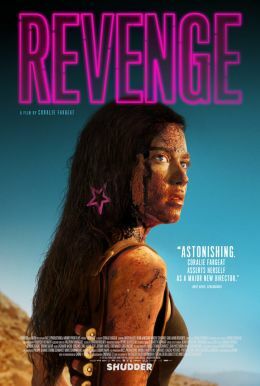 Debut director Coralie Fargeat announces her stunning new arrival, painting a crimson canvas of hypnotic beauty and bloody retribution in this razor-sharp feminist subversion of the revenge-thriller. Jen (fearlessly embodied by Matilda Lutz, "Rings") is enjoying a romantic getaway with her wealthy boyfriend which is suddenly disrupted when his sleazy friends arrive for an unannounced hunting trip. Tension mounts in the house until the situation abruptly - and viciously - intensifies, culminating in a shocking act that leaves Jen left for dead. Unfortunately for her assailants, Jen survives and reemerges with a relentless, wrathful intent: revenge. A white-knuckle tale of transgression and transformation, REVENGE gloriously blurred the lines of vengeance and survival while simultaneously delivering a ferocious dissection of gender and genre.